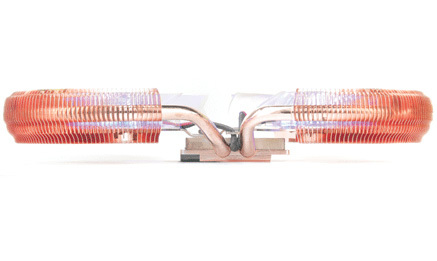 The Thermaltake DuOrb VGA Cooler features an all copper cooling system with a Dual-Orb design. Each Orb of the cooler utilizes a heat pipe to connect the base to its copper fins and an 80x15mm Scurve blade fan to drive the air. The DuOrb provides compatibility with some of the hottest nVIDIA and ATI graphics cards on the market today, with easy universal installation. Sexiness is achieved through 6 X Blue LED illumination truly setting the DuOrb VGA Cooler from Thermaltake off from the pack.